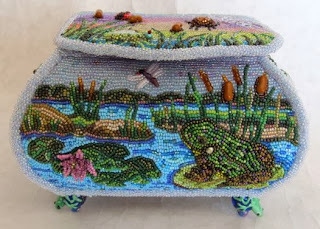 My beadwork is pictured in Marcia DeCoster's new book "Marcia DeCoster Presents". There is an interview and four pages of my beadwork in the book. Thank you, Marcia. 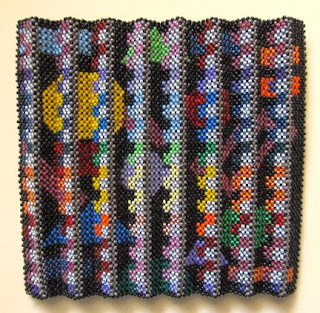 Abstract Sculpture I enjoy cubic right angle weave very much. 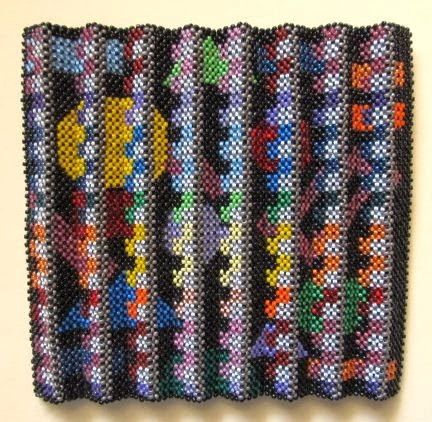 I have created a cubic right angle weave sculpture that measures 6" wide by 5 1/2" high. It is made with 11/0 seed beads. The unique feature about this piece is that it has three different designs depending on the viewing angle. 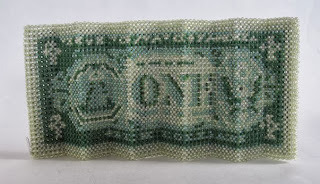 Dollar Bill in Cubic Right Angle Weave. The dollar bill is approximately the size of a real dollar, 5" x 2 1/2". 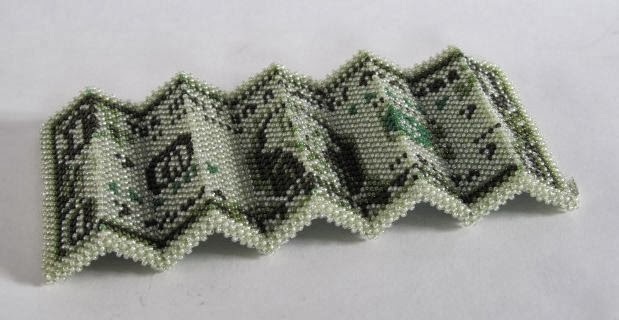 I used a real dollar bill as my pattern for this piece. 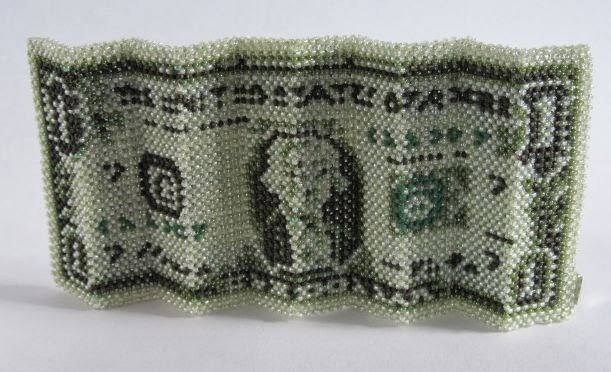 The beaded dollar bill is made with 15/0 seed beads. It has the front and the back of the bill. 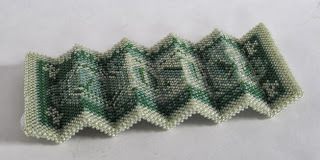 I have been asked why didn't I make a hundred dollar bill. The answer is that I didn't have a real hundred dollar bill. I had a one dollar bill. 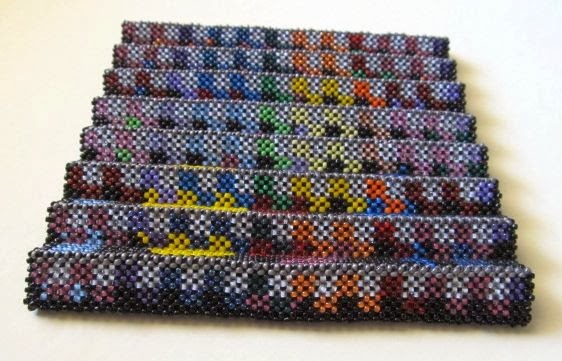 I worked the dollar in rows. I worked the front and the back of the bill at the same time. I have named my dollar bill, "It's Tough to Make a Buck". Bead Embroidered Frog Box I love doing bead embroidery. This project has taken 6 months to complete. 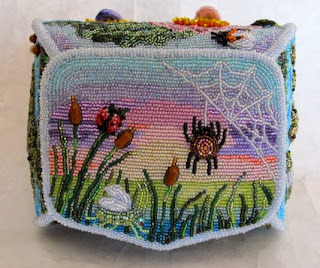 The box measures 5 7/8" wide x 4 1/2" deep x 4" high. 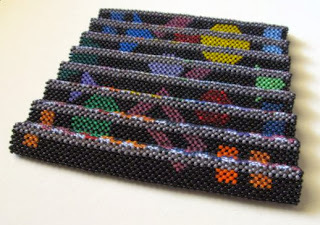 It is made with 15/0 seed beads and a few assorted special beads. 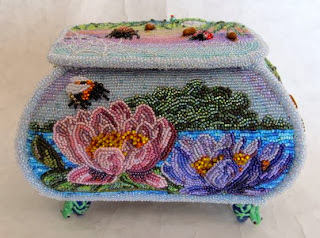 I created the box pattern and designed all six bead embroidered panels. 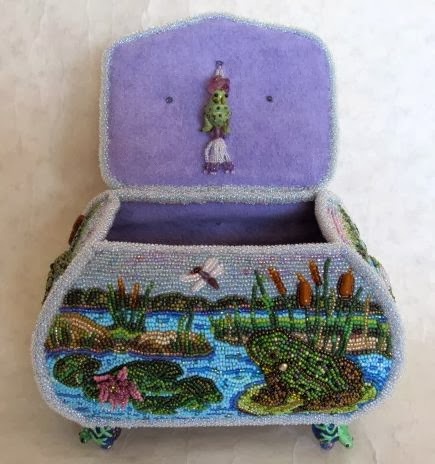 I have named my design, "Sunrise Over the Frog Pond". I worked some three dimensional beaded stump work elements on the box design. The frogs and the flower petals stand out from the background. The box is made from Ultra Suede, pellon and batting. 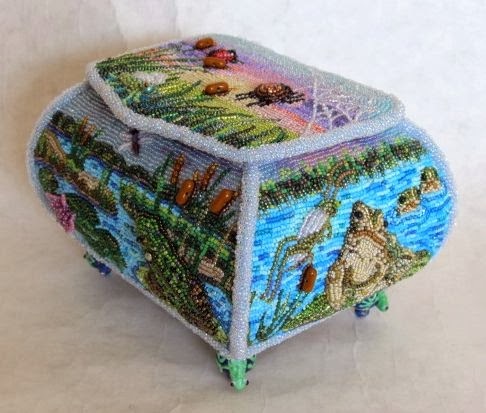 It is entirely stitched by hand. No glue was used. 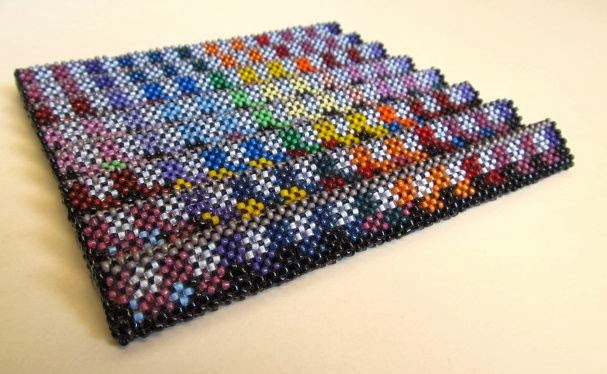 I worked out a unique way to assemble the box to make it fun and easy to complete.